What happens when you hear someone shout, "Who 'ya gonna call?" Perhaps you get all excited about seeing some ghost busting action, and head to your DVD collection so you can enjoy some spooky, comical fun. Up until now however, your call would be answered by the likes of Dan Akyroyd, Bill Murray, Sigourney Weaver, and even Rick Moranis. 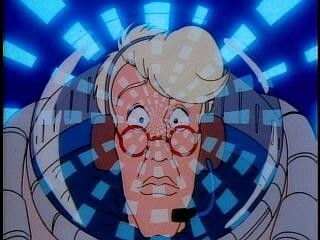 The animated program, The Real Ghostbusters, had never received any serious treatment on DVD. There were no season sets, and no releases that were taken seriously enough to suggest perhaps more would come our way. It seemed that one of the most memorable animated shows from the 80's would never see the light of day... until now. So, who took the great opportunity to finally let this series see the light of day, and 'who 'ya gonna call' to get it? Time Life! When I was a little kid, this show was pretty much the holy grail of television for me. When I went to an older friends house and found out there was a live action movie, my mind was blown. To find out that the animated series actually came after the movie? Well, I felt as if the universe was turned upside down, but in a good way. 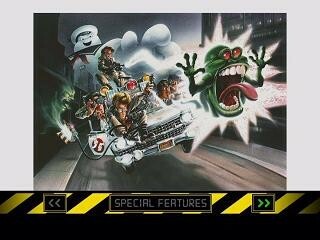 The only thing I knew as far as lighting up ghosts with a proton pack was through the world of animation. 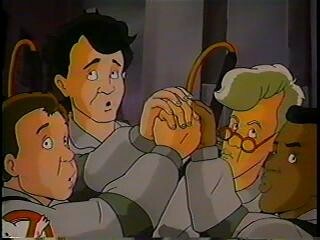 The Real Ghostbusters was supposed to be a direct sequel to the 1984 flick, and made its premiere in 1986 on ABC. In order to better fit the interest of little kids that had pretty much no attention span, some changes were made. 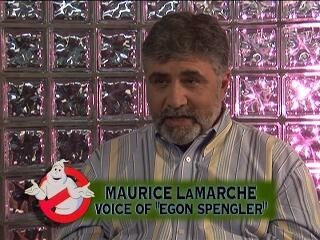 Egon, Ray, Winston, and Peter, were still doing their thing. Egon was the tech-geek, Ray got excited like a little kid over everything, Winston was a wisecracker in tough situations, and Peter was a one-line slingin' fool. Although the cores of their personalities were essentially the same, they were basically transformed into stereotypes of themselves. 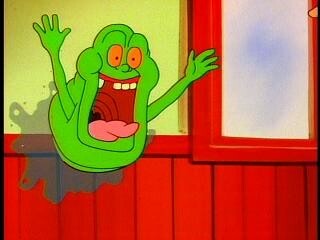 The loveable little scamp that was just another notch in the ole' ghost containment unit in the live action film, Slimer, ended up getting a lot of love in the animated series. Instead of sliming his way into a ghost trap, escorted by none other than a proton beam, it seems the ghost bustin' crew has adopted Slimer as their pet. Slimer's roar from the film was transformed into an obnoxious mix between a baby's whine and Snarf from the Thundercats, but his appetite for food and destruction remained the same. Despite the formulaic changes that sound for the worst on paper, you just can't ignore the big elephant in the room - It works. The personalities within the team all complement each other. When one jumpsuit wearin' apparition catcher is having an off moment, the others are there to reel them back in. Everything that comes out of their mouths may be predictable and unrelentingly cliché, but who has time to care? Who even wants to care? The quick pace of the show makes you forget all about the inherent problems an animated show for kids can have. You would be hard pressed to find an episode that feels like it's dragging, because this is a show that's all about getting to the good stuff as quick as possible. A few minutes are spent setting up the minimal story for the episode, a ghost rolls into town, and the rest of the episode is spent chasing, and also running from, ghosts, goblins, and monsters. By the time you're finished watching any particular half hour episode, you won't believe how fast the time flew by! In the end, the short, yet cliché dialogue fits the formula to a T. It's a show that you can sit back and turn your brain off to, and enjoy every entertaining minute. The show is smooth and goes down easy, and it offered creepy tones that kids just weren't used to, making the show even more unique and enticing than anything else on television at the time. There are some moments in the show that a kid would find genuinely creepy. The creatures that lurked in the shadows were really threatening, even with the incredibly silly overtones many of the episodes possessed. As the show continually picked up an ever growing adult fan base, the tone of show matured, the quality of the animation got better with each season, providing some really creative and spooky environmental artwork, and this caused the creep factor to increase. 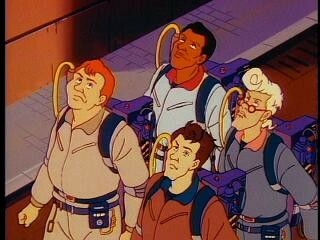 Some of the adventures The Real Ghostbusters faced were downright epic! Everything on this set isn't only in a half hour format though. There are 13 episodes that were structured in an hour long format. 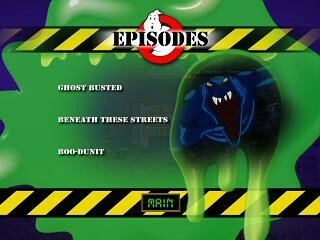 Although the ghost chasing fun is still wildly entertaining, it's broken up with cutesy cartoon shorts starring Slimer. As much as I like the little guy in small doses, I never had any interest in watching a goofy Slimer adventure when I was a kid, and I certainly have no interest seeing his solo antics as an adult. 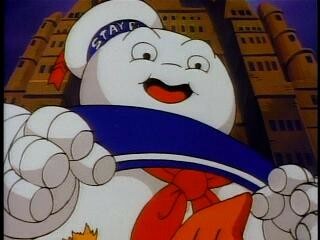 Do you have any friends that got all riled up whenever a Slimer cartoon came on? No? Yeah, me neither. 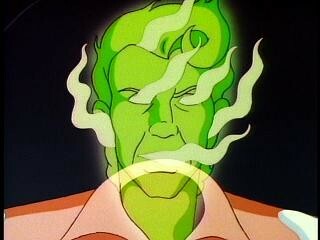 Eventually, there was even a short lived, half hour Slimer show as well! Those are included here, and although it's necessary for completist needs, I have to wonder how Slimer was ever able to gather enough popularity to warrant such a project! What's the deal? This may be a null and void analogy, but the gaining popularity of Slimer was similar to the success The Spice Girls had! 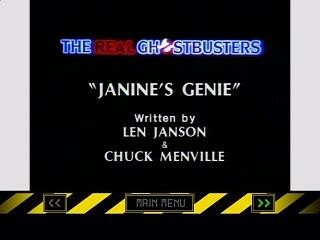 There's no need to fear though, there are well over 100 episodes in the half hour format that fans of The Real Ghostbusters fell in love with, and there's a lot of diverse content to appreciate. 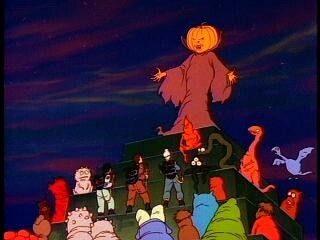 From the absolutely childish, to episodes that seemed like a middle ground was reached to keep the adult audience hooked, The Real Ghostbusters had everything it needed to grab and keep its audience. You got average guys running around with some of the coolest pieces of sci-fi weaponry in the history of both television and cinema, and they're saving the world on a per episode basis! How can you beat that?! The video quality isn't bad, but let's be completely honest here. This is a show from the mid-80's. Back then, the idea of conserving the source material for a possible home video release was unheard of. Sure, a few episodes were sprinkled over a series of VHS tapes, but who ever thought at the time, that the entire series would be given the superstar treatment as it has today? That being said, the video presentation really takes me back, because although the video is acceptable enough for its age, it certainly has issues that are inherent because of its age. There's plenty of grain, dirt, and scratches. These issues are fairly consistent, and not caused by compression issues most of the time. The color saturation isn't eye popping, and the picture isn't exactly as sharp as some of the newer animated shows on DVD, such as Family Guy. So I guess what I'm trying to say here, is that the video presentation on an HDTV isn't exactly pretty. It's far from being great, or even really good. There is a little edge enhancement in the earlier episodes from the series, although it's very minor, and not really a distraction. The edge enhancement, as well as the other age defects I've discussed, seems to get better season by season. Perhaps the source material was taken care of better as the show gained more attention and fans? It's hard to say. 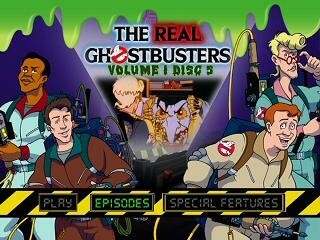 That being said, when it comes down to it, this is most likely the best The Real Ghostbusters can possibly look on DVD. There could have been a really high quality restorative process, such as Disney did with Sleeping Beauty, but come on. We all know that's just not going to happen. And I know this kind of sounds like a cop out, but the video presentation enhances the nostalgic charm of the set! If you watch this on a standard definition television, it looks pretty much the way it did when it aired on TV back in the day. The video score may not be the highest, but I want to make it clear that this is not a result of the transfer itself, it's just the age of the source showing. I know this probably goes without saying, but just so I don't get any e-mails asking this (not that I think I would), the episodes are in the 4:3 aspect ratio they were originally presented in. They didn't Dragonball Z this set by cropping the image just for the sake of having it be in widescreen. You didn't really expect 5.1 or anything more than Dobly 2.0, did you? After all, this is an animated television show from the mid-80's! Most of you will probably be fine with this though, as this is how the show was intended to sound. The stereo track hasn't been butchered by being pulled into three other directions, four if you want to include the subwoofer. The soundtrack is pretty flat compared to what we're used to today. There's no thumping bass on your regular stereo channels, and the audio for the show wasn't intended for a home theater to begin with. The dialogue is always clear though, and the mix for each episode seems to be pretty balanced, for the exception of a few of the earliest episodes. As with the video, there isn't really anything that's going to shout out 'quality' to you, but this is one of those instances where it's not really expected, because the source material was never really up to today's standard to begin with. I want to make it clear yet again, that although the sound for this set isn't receiving a high score, it has to do with the age of the source, not the transfer itself. TimeLife has done a marvelous job with the packaging, first and foremost. We've all known that this set was going to come in a box that looked like the firehouse headquarters that their operation was run from, but the promo pictures were never exactly clear on what size it would be. It would have been cool if the firehouse was excessive in size, but the box is actually not much taller than a standard DVD case. I'm actually quite pleased with the smaller size, because honestly, there are so many cool collector's box sets on most of our shelves at this point, do any of us really have the room for something as big as a small PC tower? I know I certainly don't. The left side of the building (when facing the front of the firehouse) has a window in it, featuring a holographic image of the ghost in the Ghostbusters symbol trying to saw his way out of the red sign he's been trapped behind for 20+ years. The only side of the firehouse that doesn't look like its part of the building is the very back of the box, which is black. 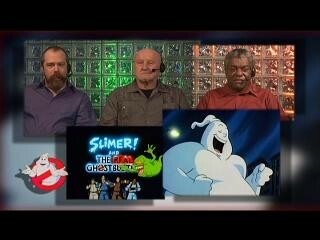 On the bottom is a picture of our four heroes, as well as their secretary Janine, and up top is a holographic image of Slimer. The top part of the firehouse box lifts off entirely to reveal the inner contents. From smallest item to largest, you'll first find a bonus disc that features over two hours of exclusive bonus material. It's inside a cardboard sleeve, so I just have to ask, why was this not included in one of the steelbooks? That doesn't really make any sense to me, especially since all the steelbooks contain five discs a piece, except for the fifth, which only houses four. Was it an oversight? It may be because the features on the bonus disc don't correlate with the episodes on volume 5 specifically, but are really extras that are after the fact. Next is a nifty little booklet, and they really did a nice job with it. Inside you'll find a rundown of which episodes are included in each season steelbook, as well as a brief description of each episode, production number, trivia tidbits, what extras are available for each disc or episode, and there's even a decent write-up on the first page telling about the history of the series. It's all in full color, and the pages aren't cheap comic book style paper either. And as I've already mentioned, there are five steelbook cases, each one containing a season of the show. The front of each steelbook is in full color, and the logo is popped out a little bit. The rear of each steelbook has a black background. When lined up next to each other when face down, they progressively show the Ghostbuster logo getting sucked into a trap. Nifty little detail! 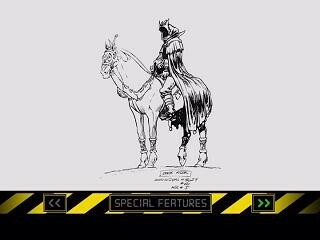 On the inside of the steelbook packaging, behind where the discs sit, there are images that are black and white sketches of early conceptual art, which can also be seen in the special features throughout the set. Almost every episode features an introduction by someone that worked on the show, and this is something that TimeLife did with their Get Smart collection as well. It's a big step that didn't have to be done, I mean, there are over 130 episodes here! TimeLife really spared no expense when putting this set together! Also available on some episodes are Isolated Music & Effects Tracks, but the real treat? Certain episodes have Visual Commentary Tracks. The bottom right hand corner of the screen will play the episode, but the rest of the screen will show people involved with the show, giving a commentary as the episode plays. The commentaries themselves are very informational, and the fact that they're still so excited about the work they produced while working on this show, is a true testament as to why it was one of the best cartoons of its time, and why unlike many other 80's cartoons (at least in my experience), still withstands the test of time. The last disc in each steelbook set comes equipped with their own proton, er, special features. I'll break them down by what volumes they appear in for you. 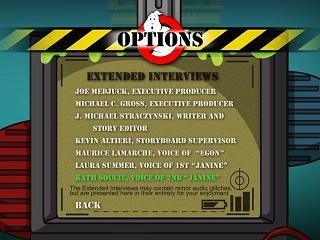 Ain't Afraid of No Ghosts: Creating The Real Ghostbusters Featurette - 25 mins - For being just under a half an hour in length, it's an extremely informative featurette. It basically tells us about the creation of the show, from coming up with the idea, to the visual style of the show, implementing decent looking special effects over the animation, the writing, and some of the limitations there were to bringing it all to life. 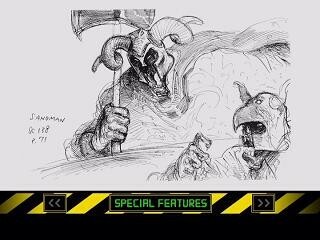 Also included is an image gallery of promotional and development art, as well as an early design gallery for the episode, Night Game. 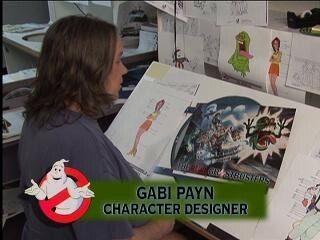 Animating The Real Ghostbusters Featurette - 24 mins - This featurette follows the process of getting a show animated from outline, to script, to designing backgrounds and monsters, to storyboards, and even choosing minor details such as color. This is another very in depth featurette, and already on volume 2, this set is looking like it's going to completely knock the ball out of the park. 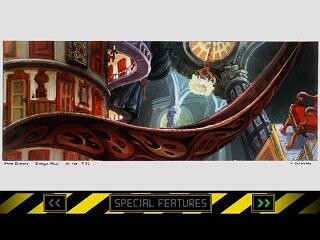 Also included is artwork for backgrounds, as well as the firehouse headquarters. 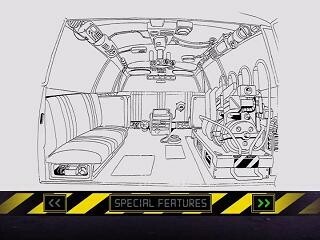 A design gallery is included for the episode, The Man Who Never Reached Home. Who You Gonna Call? 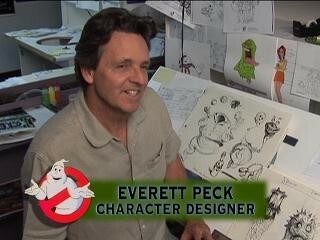 The Heroes of The Real Ghostbusters Featurette - 20 mins - An interesting featurette that details why our heroes were designed to look so different from their cinematic counterparts. I never really thought about it like this until now, but the movie had four guys in suits that were all similar in color, and they all had dark hair. Making them different in the ways we know them to be is easier for the kid audience, and even helps the animators out while making a show. Also included are image galleries feature character designs, as well as the equipment our heroes used. 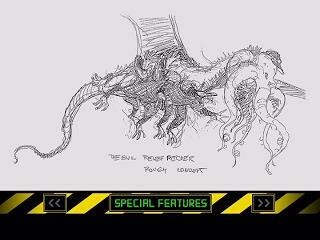 Something Strange In Your Neighborhood: The Creatures of The Real Ghostbusters Featurette - 17 mins - This featurette looks at the process of creating the monsters our heroes had to face on a regular basis. The idea behind creating a worthy adversary was simple, if you look at a monster and say, "How are our guys going to beat that thing", then the job is done. I wouldn't always say that every monster that was created throughout the history of the show really did a great job at making me ask this question, but they really did nail this about 95 percent of the time. Another great and detailed featurette! Also available, an image gallery of creature designs. I didn't skip over volume 5, it just seems that instead of throwing a fifth disc in with this particular volume, they decided to put whatever was left on a stand-alone disc in a cardboard sleeve. Don't ask me why. Promo Pilot - 4 mins - This quick promo is basically an extended opening for the show, with lots of footage never used in the series we know and love. Our heroes are all wearing the same color jumpsuits as they did in the films, and although this is a short feature, it's an important one. Major kudos for getting this dug up! A visual commentary is also available for this promo. Extended Interviews - These extended interviews, focusing on all the main players that were behind the scenes for the series, is where the excerpts from the featurettes came from. If you want even more information in an uncut form, look no further! DVD Promo Trailer - Self explanatory, this is just a quick advertisement that was shown on the web for hyping up the release of this set. Alternate Series Credits - Just a quick look at some very minor, alternate bookends for the show. They're not really different than what we're already used to seeing. Also included, is a title card gallery. This isn't really all that interesting, but boy, you can't really accuse TimeLife for not being thorough enough, can you? If all this isn't enough for you, the last disc in each volume, as well as this disc, includes DVD-Rom content as well, such as episode scripts and storyboards! The list of features is extensive, they're detailed, and there's pretty much everything here you can dream of for a show its age. TimeLife went above and beyond, and really took a set that would have been great based on the episodic content alone, and drove it home with a fantastic set of special features without ever making them feel exhaustive. You know you recognize this! You don't even have to ask, "Who 'ya gonna call?" The answer is simple. Get online, or make a call to TimeLife right now. It's a no brainer, isn't it? 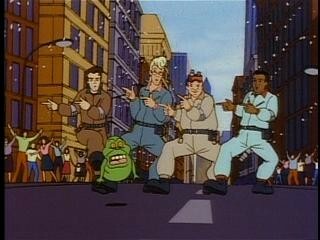 When you think about the animated cartoons that entertained the masses of the generation of kids that were born in the late 70's, early 80's, or even the adults that appreciated the animated version of a cinema classic, The Real Ghostbusters is one of the most iconic animated shows in history. To have every episode on DVD for the first time, and in a complete boxed set that looks like their firehouse headquarters to boot, is more than just a treat. It was a long time coming, and nobody skimped on putting this set together. The video may not be the cleanest thing you've ever seen if you compare it to the animated shows of today, but this is as good as The Real Ghostbusters is going to look. 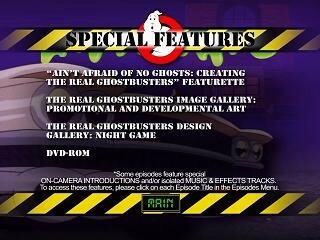 There's a slew of special features, some that none of us would ever have even thought to ask for. There's even a nice booklet that's highly detailed to accompany all of it. I'm a stingy bastage when it comes to handing out DVD Talk Collector Series ratings, but I really can't think of a reason why this set shouldn't deserve it. True, the video and audio didn't receive the highest marks, but it's due to the age of the source material, and I can't really pin that as a negative for the set itself. This is, indeed, a fine example of what a DVD Talk Collector Series release should be. Excellent content, excellent packaging, tons of special features that are extremely informative and never feel exhaustive, and even a little guide that's detailed enough to tell you whatever you want to know without having to pop in multiple discs to find what you're looking for. Not sure where a particular episode is on the set? Just open the booklet, look through the episode names, their descriptions, and the booklet will tell you which volume and which disc to find it on. It really doesn't get much better than this!